1) We don’t want to accept that there will be people who reject us or think we are foolish because of what we believe and proclaim. Yet, God clearly said, “For the message of the cross is foolishness to those who are perishing, but to us who are being saved it is the power of God” (1 Cor. 1:18). 2) We don’t want to accept that there might be times we will suffer because of the message we present. Yet, God never promised His way of growing the Church through the Gospel message would be free of obstacles. What He did promise was power to endure as we see in the Apostle Paul’s words to Timothy, “So do not be ashamed of the testimony about our Lord or of me his prisoner. 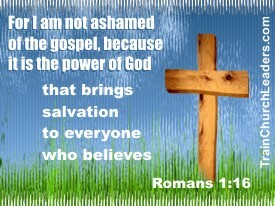 Rather, join with me in suffering for the gospel, by the power of God” (2 Tim. 1:8). Understand the power of the Gospel and you won’t be controlled by the opinions of others. Church leaders, do you want to see your church grow? Accept that with it can come misunderstandings and ridicule. Don’t get discouraged and give up at the first sign of resistance or persecution. Don’t compromise the message to alleviate the discomfort of criticism because therein is the “power of God that brings salvation” (Rom. 1:16). Just make sure that if you do come under fire it is for the Gospel and not because you were insensitive or tactless or belligerent. The Gospel is a message of grace, so we need to be filled with grace and tact in the way we present it. — “Always be prepared to give an answer to everyone who asks you to give the reason for the hope that you have. But do this with gentleness and respect, keeping a clear conscience, so that those who speak maliciously against your good behavior in Christ may be ashamed of their slander or it is better, if it is God’s will, to suffer for doing good than for doing evil” (1 Pet. 3:15-17). Trying to Attract People to Your Church by Becoming Like Them? Trying to Attract People to Your Church with Grace? Trying to Attract People to Your Church by What You Offer? Trying to Attract People to Your Church Through Manipulation? Trying to Attract People to Your Church by Watering Down the Truth? This entry was posted in Church Growth and Health.